A Few Words From Our Friends! "Magic Pendulums made by Sheree are special. They have a life of their own. They just feel good. Sheree has a heart of gold and her skill, blended with her artist's eye, creates pure masterpieces. I treasure her work and I know you will too." 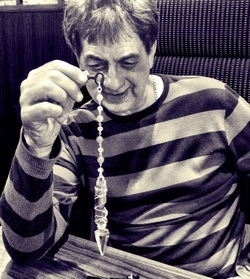 "The pendulum I got from Magic Pendulums is one of the nicest I have seen. Well balanced and very much accepted by my clients. I carry it wherever I go, as when the topic comes around to "what do you do for a living" I show them with the pendulum ( there are SO many things that one can do with a pendulum). Magic Pendulums is my pendulum source from now on." "OK, I have to come clean. I'm one of the three purchasers of The Gypsy! It arrived yesterday and is a stunning piece of work. When I saw the photo of the multi-colored glass bob I was immediately inspired how Gypsy and an aspect of work I associate with Jerome Finley can be blended together. His readers should know what I mean. As pretty as the online photo is, Gypsy (the Acid Queen, she's quite trippy ) this pendulum is even more impressive in person. With the "plates" encasing the glass bob, the sun/moon holder with the Swavorski (sic) crystal just beneath and I couldn't be happier. The bob shimmers in the light and has the perfect heft. Some people talk about having trouble getting participants to control the pendulum and one thing I've learned is that a bit of weight makes it much easier. Now I really have to come clean. I'm the one who has Stonehenge on hold which will end tomorrow. If anything happens to me, please report my wife to the authorities. She will kill me if she finds out!" I received the BLOOD BELL pendulum and I was really impressed. Is really a great piece of work and everything come with it packaging etc.. is top notch. You can tell that there is a lot of work to do things like this. I will be purchasing other pendulums for sure.. I could not be more thrilled with the pendulum that Sheree made for me and it's been getting a workout. It's a thing of beauty! "I wanted to let you know that the “Pirate Booty” pendulum arrived safely today in England. What a wonderful piece it is ! The quality is amazing and instantly you can see how much craft and skill went in to making this. It is truly beautiful. I liked the pendulum immediately when I saw it on your site but I can honestly say that the picture did not do it justice. When you hold this it’s like holding a rare priceless artifact – stunning. Please pass on my great appreciation to Sheree. Also it was so well presented in the folder and with the certificate. I’m not a man normally prone to eulogy but you should be really proud producing and selling quality pieces like this (at the price you do).The dilemma I have now is that I really don’t want to use it in performance. Thank you so much and you have thoroughly secured my support and future business. I know it's silly but this one works almost too well (if there is such a thing). And no Funs, I'm not saying it's 'haunted' or anything lol. Pendulums are such cool things in how they actually work and it's great to finally own one that not only looks the part, but as I said has it's own personality, which I put entirely down to Sheree's awesome work. If you look on their site it would seem she's created a pendulum for every need and taste, from gaudy flamboyant crystals, to voodoo creepies, to my little hagstone. I just received my first pendulum: "The Monarch" from David Thiel at Magic Pendulums. I was very much on the fence about purchasing a pendulum when I figured I could make my own - like I need another project! Last Monday evening, I was screen-shopping David's site and the perfect pendulum jumped out at me crying: "Two made - one left!" "I just received the pendulum today and it is far more elegant in-person than I ever would have expected. It is truly a art piece. Thanks to Sheree for the wonderful design." Now I hope that I can keep myself from calling it, "My Precious!" "Well you did say wait until Tuesday and you were absolutely correct. Dragonfire swept in through my letterbox this very morning and I am absolutely delighted with her. Ever since it arrived I have had an nasty feeling in the pit of my stomach...a power if you will, She stayed unopened for the first few hours, a kind of rest I thought was in order after the grand journey she made. She came with a box of Konxari cards I ordered from Matt Busch so they may have spoken with each other and shared stories of their travels. I like the way everything smells too, such authenticity and for this I really pleased. When I start using her I will let you know how she responds with me as her owner. Feel free to duplicate this email on your website or in any forum you so wish. Many thanks again for all your help and advice. "While attempting to free my Dark Promise pendulum from it's wire binding (David and Sheree go to lengths to present these in style) it drew blood from my thumb. The wicked, evil, beautiful thing! Oh, the horror...THE HORROR! " Andre...did you say "Hello" to your new pendulum before you tried ripping her out of her shelter? Did you do anything by way of greeting...or claiming her for your own??? HUH??? I rather think not. I expect you approached it like a Cossack approaches a Russian maiden after battle. (Sniff) Of course she bit you. But you're blood bonded now -- and things should be fine. "Like a Cossack approaches a Russian maiden after battle? I like that. You must have known me when I was younger. Oh, this she-devil pendulum is vile and willful, but I love her though she drinketh of my blood!" When you thay thuff like 'she drinketh of my blood' it thounds like you're lithping. There was a knock upon my door. As, soon as I got there,I could see a postal carrier running to a truck, that does not usually stop here. I looked down to the porch. A package was sitting there. I knew it was 'Nightmare'! I took her in and let her sit on the coffee table briefly, she was calling to me to release her from her containment. As I opened the package, I could smell the scents of herbs,roots and fire emitting from her! The smell had a strange but ensuring aroma. The Lady 'S' was home where she belonged!!! Her Beauty and the feel of her touch was sweet,but could cut through you as the finest blade! Then as I held her in my hands, I introduced her to Alice,and his Nightmare too ! She is greatly balanced,and photos do not do her justice! David and Sheree added so many touches,even in the presentation of her as she is unveiled ! She also has a wonderful Certificate Of Authenticity signed and dated by Sheree ! Just wanted to say thank you on creating my 'Nightmare'! "I know it's silly but this one works almost too well (if there is such a thing). I'm not saying it's 'haunted' or anything. Pendulums are such cool things in how they actually work and it's great to finally own one that not only looks the part, but as I said has it's own personality, which I put entirely down to Sheree's awesome work. If you look on their site it would seem she's created a pendulum for every need and taste, from gaudy flamboyant crystals, to voodoo creepies, to my little hagstone. I started dabbling in this kind of presentation a few years ago and have always used everyday items as pendulums (lockets and watchchains mainly) but my new one just takes it to a new level. An almost effortless level. I've shown it to three people so far today who have been satisfyingly creeped out by it's eerie powers. I cant wait to actually work up some routines about the stone itself and perform with this one. Anyone wanting an interesting 'artifact' to work into their act should take a look at one of these. And that's pretty much my official review."